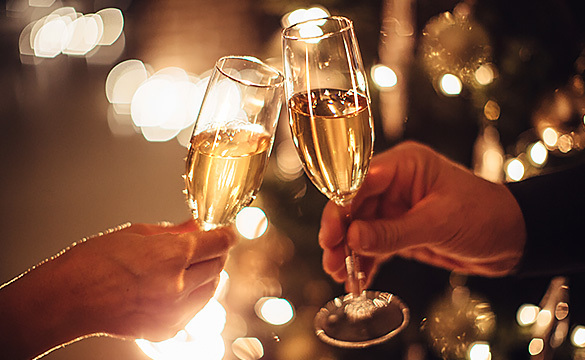 Receive 15 off, complimentary valet parking and a $25 dining card per night of stay to your choice of High Cotton, SNOB or Hall's Chophouse when you book our select dates. A valid credit card is required at the time of reservation to hold the reservation. The credit will be authorized pre-arrival to ensure validity, however no deposit will be taken. Cancellations are accepted without penalty up to 7 days before 4 p.m. on day of arrival. Cancellations within the 7 day cancellation policy are subject to first night’s room and tax. No refunds. Please be aware attempting to modify a reservation within the 7-day cancellation period will be considered a cancellation. Your credit card will be kept on file to guarantee your reservation. 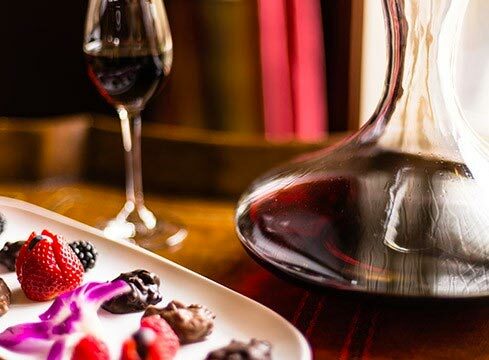 Experience the world's most romantic cities from three exclusive points of view. 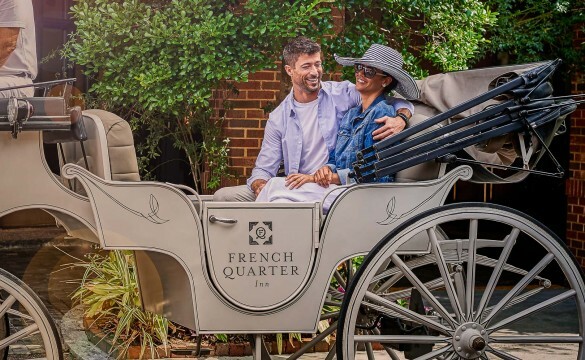 The French Quarter Inn’s two-night Charleston Perspective package showcases one of the world’s most romantic cities from three exclusive points of view: a helicopter tour with champagne, a Charleston Harbor sail on a private yacht, and a private carriage tour. Including transportation and a $100 Hall's Chophouse gift certificate. Rate is based on double-occupancy. A 7-day advanced reservation notice is required. Cancellations must be made 7 days before 4 pm of the day of arrival. Guests who do not cancel within this time will be charged for a one-night stay with tax. Gratuity not included for activities. All activities are weather permitting and subject to time availability by vendor. Helicopter tour cannot accommodate more than two in a single flight. A bouquet of seasonal blooms kicks off a "Just the Two of Us" escape. A bouquet of seasonal blooms kicks off a “Just the Two of Us” escape at the elegant French Quarter Inn, a dreamy interlude that includes dinner at one of Charleston’s most romantic restaurants, a private carriage-ride, rose petal turndown service, chocolate strawberries and bottle of champagne. 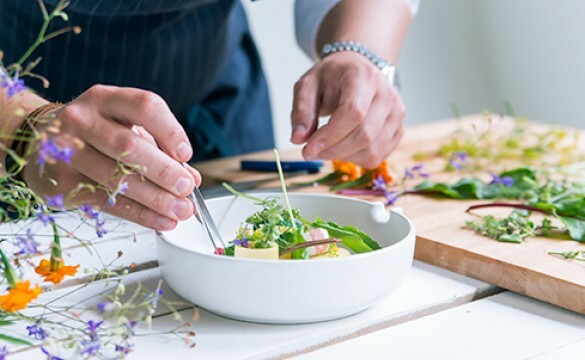 Embark on an immersive, hands on culinary journey through Old Charleston. A private full-day culinary journey led by Gullah expert Chef Benjamin Dennis. *2 night minimum stay and advanced reservations are required, please call the hotel and confirm dates. Subject to availability **A 50% deposit is required when making reservations for this package. This deposit is refundable if canceled at least 7 days prior to scheduled arrival. Experience a taste of the Lowcountry by sampling oysters at three of Charleston’s renowned seafood restaurants. transportation to and from each restaurant can be arranged upon request. No substitutions. 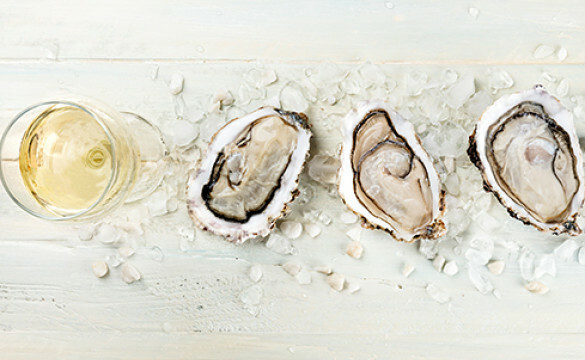 Oysters exclusively redeemable at each restaurant’s bar area. Beverages are not included and will be charged separately. Tax and gratuity not included. Leave the wheels at home; we've got you covered. No transportation? No problem! The French Quarter Inn's got you covered. This exclusive package offers private transportation to and from the Charleston International Airport, as well as access to our bike rentals to explore downtown once you’ve settled in. For those who prefer to take a backseat, enjoy the ride with an additional $20 credit for private transportation or a bike taxi. For new reservations only. Cannot be combined with other offers. Blackout dates may apply. Offer is subject to availability. We pride ourselves on providing our guests with an experience that can only be described as true Southern hospitality. 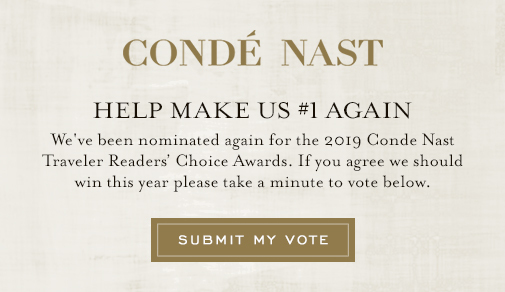 It’s just one of the reasons Travel + Leisure and Conde Nast Traveler consistently rank our historic Charleston inn among the country’s best hotels. Begin a day of exploring with our complimentary European continental breakfast. Served in the lobby, on the terrace or delivered directly to your guest room, it features fresh berries and melon, whole fruit, bagels and baked goods, petite quiches, eggs, and more. One pillow doesn't fit all! Buckwheat, down, cool gel, hypoallergenic and Swedish massage are just some of the choices you’ll find on our "Sound Sleep" menu featuring seven extraordinarily comfortable pillows. Sweeter dreams start here! We can’t think of a better way to see Charleston than by beach cruiser. Borrow one of ours (complete with basket to stow sunscreen and souvenirs) and head to the bike-friendly Arthur Ravenel Jr Bridge for postcard harbor and city views. You can’t pass through the lobby of the French Quarter Inn without stopping to sample a refreshing selection of flavored iced teas, infused waters, sweet and savory snacks, and seriously good coffee (served 24/7). Help yourself!